PY153 New Gamboge, specifically the W&N version has been my favourite warm yellow, my ‘go to’ colour whenever I need a warm toned yellow. I’ve discovered too late that my tiny tube is about empty, having cut open the end and peeled back the tube has helped, but the day is fast approaching that it will finally be gone. My first reaction was that there must be some left somewhere, I just have to find it. An evening spent online revealed that sadly, it's too late. There is no more to be had. I thought that there might be a pigment available to artists that would be a good substitute. Several purchases later I haven’t found one that will serve the purpose. Those which looked promising online arrived and I find they are not as pictured. None will do. Despite being lovely colours in their own right, they are too close to orange and have almost no yellow, even in tints, despite being called yellow. So I’m left with creating a mix. Permanent – all my paints are rated as highly lightfast. Transparent or Semi Transparent – PY153 was listed by W&N as Opaque, but mixing 2 colours to replace it, I feel it’s better to keep transparency if possible as I use it to mix other colours. Non Granulating. Warm yellow but not orange. Easily mixed to an exact replacement without endless colour correcting. Has the same colour constancy as PY153. Works in mixes of greens and oranges producing the same range of colours as W&N New Gamboge PY153 (old). First I set about choosing the yellows to work with. After spending time looking at the qualities of PY153, I narrowed my choices down to three. Winsor Lemon PY175 (almost Transp. ), Permanent lemon PY109 (Transp. ), Sennellier Yellow PY154 (almost Transp.) – this pigment is also sold by W&N and others. Next, I identified the likely candidates for mixing a credible match to PY153. 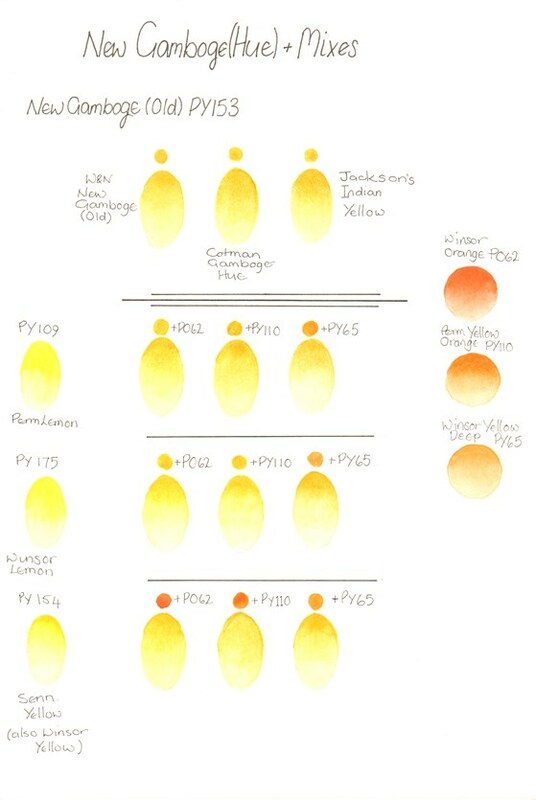 These I narrowed down to Winsor Orange (yellow shade) PO62 (Opaque), Permanent Deep Yellow PY110 (Semi Opaque) and Winsor Yellow Deep PY65(Semi Transp.). 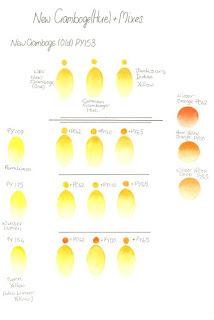 I had hoped that Winsor Yellow Deep PY65 would be a like for like substitute after looking at the swatches on the W&N website but was sadly disappointed. After a day of careful mixing, matching, and testing, I found that a mix of one from each group would make a very similar colour. However, I wanted as near identical as possible. For me, Permanent Lemon PY109 + Winsor Orange PO62 was the closest match and the easiest to get right quickly and reliably. Followed by Winsor Lemon PY175 + Winsor Orange PO62. Both PY110 and PY65 also make good matches with the Lemon paints but are a little trickier to get right. The best I can recommend is to try out mixes with the colours you have, but make sure you have a good swatch of your New Gamboge PY153 (old) of choice to compare it with. Preferably on the same paper. Also, transparent or near transparent colours work best. If you have any interesting colour mixes for New Gamboge PY153 (old) let me know. How Many Colours Do You Need To Paint flowers? Botanical Artist and Botanical Painting tutor for the London Art College I paint highly detailed and accurate plant portraits and illustrations, and also have an interest in the paints and papers that I use. All images and text on this blog are protected by copyright law and may not be reproduced, stored or transmitted in any form without the artist's permission. I make no warranties about the completeness, reliability or accuracy of this information. Any action you take upon the information on this blog is strictly at your own risk, and I will not be liable for any losses or damages in connection with the use of this blog. With grateful thanks to Finn O'Leary for manually manipulating the stylesheet of this blog. Powered by Blogger.